This exclusive hand illustrated print features an abstract inspired design. By using a mix of mediums such as charcoal and collage, this pattern is full of eye-catching tones and movement. 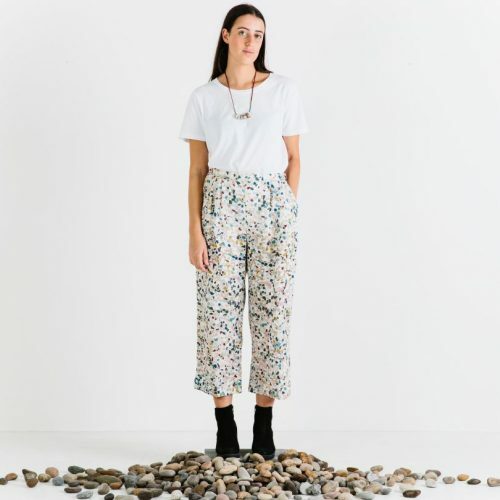 The fabric has been digitally printed onto a soft silk viscose and style has a long line, with a scoop hem shape and features almost full-length sleeves, side splits, pockets and a contrasting rib neckband. The loose cut is both chic and comfortable. Perfect paired with sneakers for sunny days in the city, or with sandals for vacation days. A unique print, designed and made in Melbourne. Refer to our Sizing Guide for more information.